Every homeowner understands the difference between their mortgage and the equity they have in their home but when it comes to commercial real estate transactions, the difference between equity, preferred equity, mezzanine debt and senior debt can confuse even savvy investors. 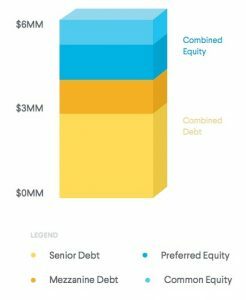 The simplest deals will be just equity and senior debt, while the most complicated may have multiple tranches of mezzanine debt or senior debt that is later syndicated out into multiple notes. The equity component of the capital stack may be arranged in complex waterfall payment structures and return hurdles (which we’ll discuss in greater depth later in this series). For now, let’s focus on the four components of the capital stack you’re most likely to encounter when investing in real estate through an online investment or crowdfunding platform, going from the least to most risky: senior debt, mezzanine debt, preferred equity, and common equity. …is secured by a mortgage or deed of trust on the property itself, so if the borrower fails to pay the the lender can take title to the property. This greatly reduces risk on the principal invested because, at worst, the lender owns the property and will look to maximize value by selling the property or selling the non-performing loan. The “cost” of this lower level of risk is a lower yield on the money invested. To properly understand the risk involved, look at the loan-to-value (“LTV”) ratio of the loan – if the loan has a 60% LTV there is a lot more margin for error than an 85% LTV loan. It’s a simple analysis: in the worst case scenario, as the lender, you’d much rather end up owning the property at 60% of its value than 85%. …sits below the senior debt in order of payment priority. Once the developer pays operating expenses and the senior debt payment all income must go to pay the fixed coupon of the mezzanine debt. If the developer is unable to pay (assuming they aren’t also in default under the senior debt), the lender typically has the ability to quickly take control of the property. The senior debt and mezzanine lenders will usually enter into an agreement, called an intercreditor agreement, where they spell out how their rights interact (i.e., what happens if a developer stops paying both of them). 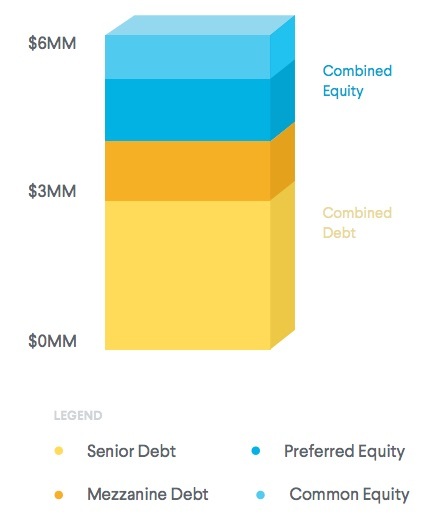 Mezzanine debt typically has a higher rate of return than senior debt but lower than equity. For more on mezzanine debt, how it is used, and the particulars of investing at this point in the capital stack, please refer to this article. …is perhaps the hardest portion of the capital stack to speak about generally because, for better and worse, it’s very flexible. Preferred equity holders have a preferred right to payments over regular (common) equity holders. “Pref” equity positions range from “hard” preferred equity, which function similarly to mezzanine debt and include a fixed coupon and maturity date to “soft” preferred equity, which is more likely to include some of the financial upside if the project performs well. While hard preferred equity holders may have the ability to make some decisions or kick out the developer if they fail to make payments, soft preferred equity holders typically have more limited rights. As you’d imagine, the rate of return for hard preferred equity is similar (or slightly better) than mezzanine debt, while soft preferred equity returns can be substantially better. Preferred equity and mezzanine debt fulfill similar functions in the capital stack: forms of “bridge financing” – methods of financing short-term capital needs to fill a gap between the debt and equity components of the overall project’s capitalization. Both entail some recourse provisions for the holder of the position. 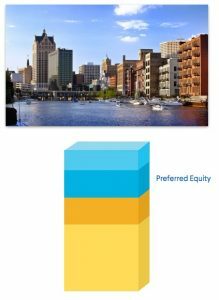 For more on benefits of preferred equity real estate investing, and how it is used in the capital stack, please review this article. …is the riskiest and most profitable portion of the real estate capital stack. Typically the GP investor (the developer or sponsor) will be required – by the lender and/or by other equity investors – to invest their own money as some portion of the equity to have skin in the game. Equity investments carry the greatest risk, because investment agreements entitle every other tranche of capital to be repaid before common equity holders. However, if the property does well equity investors usually have no cap on their potential returns. In real estate, equity is typically structured so that all investors earn a preferred return until they hit a certain annual return hurdle (i.e., 8%). After that, the developer will earn a disproportionate share of the profits (i.e., 40% of all the remaining profit), while investors receive the rest of what’s left pro rata. for more on preferred return in real estate, please refer to this article. 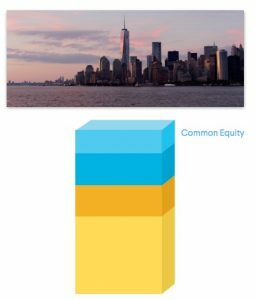 Though common equity is generally the highest-risk, highest-upside portion of the capital stack, not all common equity investments are created equal with respect to risk/return profile. A healthy preferred return written into an investment agreement can mitigate some downside risk for passive investors (we typically strive to negotiate attractive preferred returns on behalf of EquityMultiple investors). Capitalization Rates: how conservatively the exit (or “going out”) cap rate is modeled. For more, please review this article. Market: Generally, gateway markets like New York City or San Francisco will offer more downside protection (less risk) but, accordingly, less upside potential. This is because dense, affluent knowledge centers such as these enjoy robust and diverse rental demand but are hence home to some of the most competitive real estate markets in the world, dampening return potential. It’s no coincidence that markets like New York City become particularly appealing for global investors in times of economic volatility. Conversely, lesser-known secondary and tertiary markets may offer more robust demand growth opportunities, and upside for commercial real estate investment, but greater risk due to less established, less diverse local economies. Business Plan: Equity investments can offer an array of risk/return profiles based on the underlying strategy. The amount of capital expenditure needed, the complexity of the project, and the in-place rent roll and cash flow all impact the risk and potential return of an investment. For more on this topic, please review this article. Such considerations matter for investments throughout the capital stack. However, such attributes of an investment can magnify risk and return potential for a common equity investment to a greater extent, as passive investors have fewer protections but can enjoy uncapped upside. Understanding the different investment structures across the capital stack is critical to making real estate part of your portfolio. Much like investing in stocks and bonds, how you allocate between equity and debt real estate investments should depend on your investment goals and strategy, including your risk tolerance. For risk-tolerant investors, heavier exposure to real estate equity may be more appealing. Risk-averse investors may find the relative security and short terms of senior debt or mezzanine debt more appealing. While studies repeatedly show that “timing the market” is next to impossible, even for experienced investors, timing considerations can also help guide portfolio strategy. As of Q2 2019, with many economists predicting at least a mild correction within 18 months, the short hold periods of preferred equity and debt investments carry greater appeal. After many years of a bull market, finding good value equity investment opportunities becomes more difficult, leading some investors to weight their portfolios towards debt, saving their equity investment dollars for situations where they have greater conviction. For most investors, a diversified approach makes sense both for the real estate portion of their portfolio and the portfolio as a whole. Investors can potentially reduce overall risk exposure while maintaining long-term appreciation and upside by spreading their real estate investments across the capital stack.